The housing market in Rotorua might be pretty hot at the moment, but not all houses are selling. 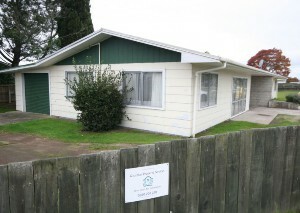 A house on the corner of Te Ngae and Owhata Rds failed to sell at a Professional McDowells auction last week. The property suits an investor as it has two tenancies, on periodic leases, and returns $350 in rent a week. Two bidders took the price up to $250,000 but that was insufficient to satisfy the vendors. If sold at that price the property would have a 7.2% gross yield. The property has an RV of $180,000 and is on a 1,072m2 section. However, the rent is now reported to be $345 per week. With these numbers the property represents a 6% gross yield. Meanwhile First National auctioned a three-bedroom Glenholme house today which sold under the hammer for $466,000 - $156,00 higher than its capital value which was last set in 2014. The property was marketed as a good option for people wanting to downsize. That appeared to be the case with a significant proportion of the people at the auction falling into the older demographic. However, there was a rental appraisal provided which suggested the house could rent for between$450 and $470 a week. At the higher rental rate the sale price represents a yield of just over 5%. The 1980s, 180 m2 house sits on a one third share of cross-lease section. Telfer Young valuer Mike James says properties like this in Glenholme are highly sought after. He warned buyers not to put too much weight on CVs which were most recently set in 2014. “Rating values are quite out of kilter (with the current market),” he says. Commercial property investors looking for a good yield snapped up a number of the RD1 stores put up for sale by its ultimate owner Fonterra. The bigger stores in more established centres sold on yields around 6.5%, however the less desirable investment locations were sold on yields around more than 7.5%. A number of other RD1 stores were sold at auction in Hamilton and had similar results. The auction was run by Bayleys.